﻿ Fun Easy English - Environment - Global warming - Climate change Indicators: Sea Surface Temperature. This indicator describes global trends in sea surface temperature. Sea surface temperature increased during the 20th century and continues to rise. From 1901 through 2015, temperature rose at an average rate of 0.13°F per decade (see Figure 1). 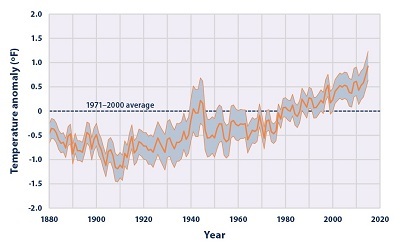 Sea surface temperature has been consistently higher during the past three decades than at any other time since reliable observations began in 1880 (see Figure 1). Based on the historical record, increases in sea surface temperature have largely occurred over two key periods: between 1910 and 1940, and from about 1970 to the present. Sea surface temperature appears to have cooled between 1880 and 1910 (see Figure 1). 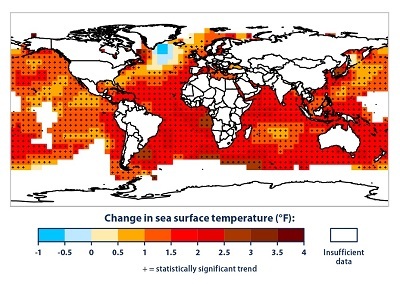 Changes in sea surface temperature vary regionally. While most parts of the world’s oceans have seen temperature rise, a few areas have actually experienced cooling—for example, parts of the North Atlantic (see Figure 2). Sea surface temperature—the temperature of the water at the ocean surface—is an important physical attribute of the world’s oceans. The surface temperature of the world’s oceans varies mainly with latitude, with the warmest waters generally near the equator and the coldest waters in the Arctic and Antarctic regions. As the oceans absorb more heat, sea surface temperature increases and the ocean circulation patterns that transport warm and cold water around the globe change. Changes in sea surface temperature can alter marine ecosystems in several ways. For example, variations in ocean temperature can affect what species of plants, animals, and microbes are present in a location, alter migration and breeding patterns, threaten sensitive ocean life such as corals, and change the frequency and intensity of harmful algal blooms such as “red tide.” Over the long term, increases in sea surface temperature could also reduce the circulation patterns that bring nutrients from the deep sea to surface waters. Changes in reef habitat and nutrient supply could dramatically alter ocean ecosystems and lead to declines in fish populations, which in turn could affect people who depend on fishing for food or jobs. Because the oceans continuously interact with the atmosphere, sea surface temperature can also have profound effects on global climate. Increases in sea surface temperature have led to an increase in the amount of atmospheric water vapor over the oceans. This water vapor feeds weather systems that produce precipitation, increasing the risk of heavy rain and snow (see the Heavy Precipitation and Tropical Cyclone Activity indicators). Changes in sea surface temperature can shift storm tracks, potentially contributing to droughts in some areas. Increases in sea surface temperature are also expected to lengthen the growth season for certain bacteria that can contaminate seafood and cause foodborne illnesses, thereby increasing the risk of health effects. This indicator tracks average global sea surface temperature from 1880 through 2015. It also includes a map to show how change in sea surface temperature has varied across the world’s oceans since 1901. Techniques for measuring sea surface temperature have evolved since the 1800s. For instance, the earliest data were collected by inserting a thermometer into a water sample collected by lowering a bucket from a ship. Today, temperature measurements are collected more systematically from ships, as well as at stationary and drifting buoys. The National Oceanic and Atmospheric Administration has carefully reconstructed and filtered the data in Figure 1 to correct for biases in the different collection techniques and to minimize the effects of sampling changes over various locations and times. The data are shown as anomalies, or differences, compared with the average sea surface temperature from 1971 to 2000. The map in Figure 2 was developed by the Intergovernmental Panel on Climate Change, which calculated long-term trends based on a collection of published studies. Both components of this indicator are based on instrumental measurements of surface water temperature. Due to denser sampling and improvements in sampling design and measurement techniques, newer data are more precise than older data. The earlier trends shown by this indicator have less certainty because of lower sampling frequency and less precise sampling methods. Data for Figure 1 were provided by the National Oceanic and Atmospheric Administration’s National Centers for Environmental Information and are available online at: www.ncdc.noaa.gov/data-access/marineocean-data/extended-reconstructed-sea-surface-temperature-ersst. 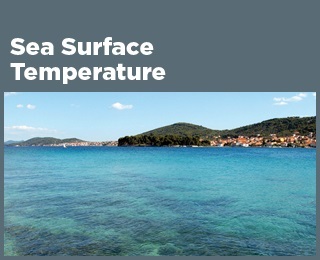 These data were reconstructed from measurements of water temperature, which are available from the National Oceanic and Atmospheric Administration at: http://icoads.noaa.gov/products.html. Figure 2 is an updated version of a map that appeared in the Intergovernmental Panel on Climate Change’s Fifth Assessment Report http://ipcc.ch/report/ar5/wg1, which gathered data from a variety of studies that provide the best available information about climate change. This map shows how average sea surface temperature around the world changed between 1901 and 2015. It is based on a combination of direct measurements and satellite measurements. A black “+” symbol in the middle of a square on the map means the trend shown is statistically significant. White areas did not have enough data to calculate reliable long-term trends.